The eighteenth-century model of the criminal trial - with its insistence that the defendant and the facts of a case could 'speak for themselves' - was abandoned in 1836, when legislation enabled barristers to address the jury on behalf of prisoners charged with felony. Increasingly, professional acts of interpretation were seen as necessary to achieve a just verdict, thereby silencing the prisoner and affecting the testimony given by eye witnesses at criminal trials. Jan-Melissa Schramm examines the profound impact of the changing nature of evidence in law and theology on literary narrative in the nineteenth century. Already a locus of theological conflict, the idea of testimony became a fiercely contested motif of Victorian debate about the ethics of literary and legal representation. She argues that authors of fiction created a style of literary advocacy which both imitated, and reacted against, the example of their storytelling counterparts at the Bar. 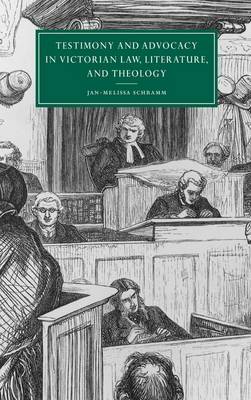 Buy Testimony and Advocacy in Victorian Law, Literature, and Theology by Jan-Melissa Schramm from Australia's Online Independent Bookstore, Boomerang Books.